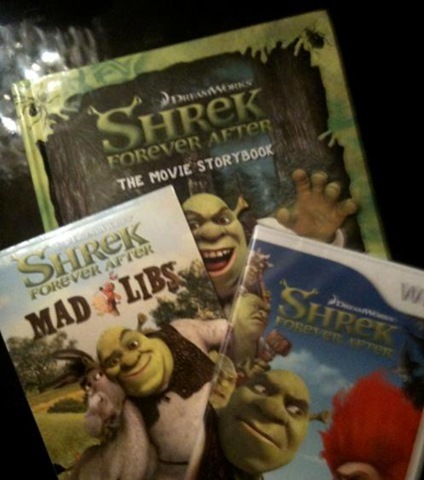 NOTE: The morning after receiving my copy of Shrek Forever After by Activision my son got sick. He was already scheduled for a tonsillectomy and adenoidectomy for the coming Thursday. So this put us behind schedule. And it was very important to my son that he finish the game and give tips for each level to my readers. 🙂 Then our lives were interrupted by some other not so pleasant circumstances. But we think things are getting somewhat back to normal, now. Is it here yet? Not yet. Is it here now? No, Sweetie. Now? Not yet. Maybe it got lost? No, Cody it didn’t get lost. This is pretty much the conversation that went on in our home for three days. On the fourth day… Is it here yet? Yes, Dear. Finally! On Friday I had one very excited little boy. First, he loves Shrek. My husband and I do too, for that matter. Second, he loves when he is allowed to play video games. He’s only 7, but is a natural at playing video games… but, we try to keep his video playing to a minimum. It just so happened that the day the game came was his last (half day) day of school. So he asked if he could play it until he beat/finished the game. Seriously. He wanted to play the game continuously until he beat it. After much bargaining, pleading, begging… I did cave and told him – because it was the first weekend of his Summer break – he could play it for up to 3 hours (not straight) a day until he beat the game. He did play for 3 hours on Friday… but woke up in the wee hours of Saturday morning sick and as I mentioned above he had his tonsils and adenoids removed that same week and didn’t feel like playing much. He did beat the game and I’ve finally had a moment to write up his review. So sorry it’s so late. Wii highly recommend Shrek Forever After for any child – in our opinion, it would be a hit with any child approximately 7 to 10 years-olds. It has occasional basic puzzles to solve and some bad guys to fight. Don’t get me wrong… this is NOT a graphic game. Just fun! We haven’t had a chance to see the movie yet, but the game was a great build up for it. If you have kids who love Shrek it’s worth checking out. Whether you have a Wii, Nintendo DS, Xbox 360 or Playstation 3, I highly recommend this video game. As of this review it’s available for $46.99 at Amazon.com. Disclosure: I wrote this review while participating in a blog tour campaign by Mom Central on behalf of Activision and received the items necessary to facilitate my review. In addition, Mom Central sent me a gift card to thank me for taking the time to participate.